eAssignments: Which is the right tool for me? eAssessment is gaining more and more popularity in the HE sector. Students are demanding the convenience that electronic submission gives them and so with a number of tools on offer within Learning Edge you have the opportunity to give your students what they are looking for. Learning Edge currently has 3 tools to allow your students to submit electronically; Blackboard Assignment, Assignment Handler and Turnitin. Don’t forget the potential of blogs and journals that can enable your students to submit work whilst also working in groups collaboratively which can also be assessed. You may have heard of Turnitin, but what are the reasons for using it? Turnitin is a very powerful plagiarism detection tool – but in the wrong hands can create real confusion! Turnitin allows you to help your students formatively construct a well referenced piece of academic writing by helping them to see where they may not have referenced or acknowledged someone else’s work in the correct way. There is no ‘good’ or ‘bad’ percentage in Turnitin, because it depends on what you, the tutor, are looking for and what the nature of the assignment is that you have set. Give your students the chance to check their work – try not to jump to any conclusions about their report if it looks bad from the percentage figure. Have a closer look at the submission and then decide what is going on. It may be that your student just needs a little extra advice or guidance on writing a referenced piece of work. Before deciding to use Turnitin, think about what the contents of the assignment will be. There is no need to set a Turnitin assignment for a poster presentation as there is no bibliography for instance and besides, Turnitin does not accept PowerPoint format! Neither does it accept Excel spreadsheets, databases, multimedia, images or other more unusual file formats. Basically, it accepts text, and the best kind of text it accepts is in essay form! It is also worth noting that Turnitin only accepts one file for each submission drop box. So if you want 2 pieces submitted for the same assignment, you will either have to set up 2 drop boxes or ask the students to combine them into one document. 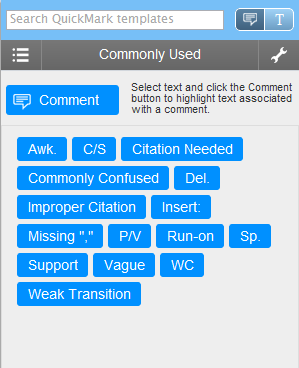 When it comes to marking, Turnitin does make it very easy to add floating comments onto the script, so students can see exactly where you made the comments and can then read a larger summary – but be aware, Turnitin ‘general comments’ area is limited to 5000 characters… now this may sound a lot but by the time you have taken into account spaces and full stops, 5000 characters quickly disappears! TIP! If you are receiving an error message when trying to save the comments it may be you have entered too many characters! Turnitin marking requires you to have an active internet connection as you are actually only marking ‘online’, so please take this into account when you are planning to start marking. The Blackboard Assignment tool accepts multiple files at a time and also can take any format of file – so if you need your students to submit a spreadsheet they can! Marking using the Blackboard Assignment tool involves an extra step (to download the assignments), but this may be your preferred method of marking (e.g. Word and comments). The Assignment Handler tool also allows you to bulk download the submissions so that you can mark them offline at a time that suits you – not only when you have an active internet connection! 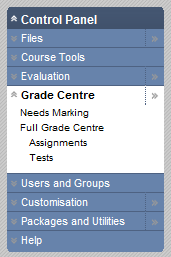 All tools integrate into the Blackboard ‘Grade Centre’. Please note that ‘Grade Centre’ is the overarching tool in Blackboard that ‘picks up’ grades that you have entered from the various tools (including Assignments, Turnitin, Blogs & Journals, etc.) and pulls them into one uniform area where they can be managed (or downloaded) whereas ‘GradeMark’ refers to the marking tool within Turnitin. You should ensure that you have a method for giving feedback to students when using eAssessment. You do not necessarily have to mark on screen, or even read the scripts on screen but there are different ways to manage your marking work load. Some still prefer to print and read the submission in paper form. Some prefer to download them all so they can then read at their leisure. Your department may choose to fill in paper feedback forms to hand back to your students, or you may have an electronic feedback form that your faculty or department has supplied. Or, as mentioned before you may simply wish to put comments onto a submission using Word or by using Turnitin’s GradeMark feature. Discuss with your department about how to give feedback to your students. On a final note, it is worth mentioning that using the Blackboard Assignment tool can add to the robustness of your course. Blackboard have a service level agreement (SLA) with the University to deliver 99.9% ‘up time’, and also 24-7 support. If the system goes down for any reason, Blackboard is alerted and the problem is dealt with quickly. Turnitin is a third party piece of software and as such has a different agreement for guaranteed ‘up-time’ and policy of reliability. This entry was posted in Blackboard, eAssessment, Learning Edge, Turnitin and tagged assignment, blackboard, eassessments, eassignments, handler, submission, turnitin by Carol Chatten. Bookmark the permalink.